The Craftsman Door Company is a small custom shop dedicated to producing the finest doors and windows in the Arts-and-Crafts style. With each door or window I build, I strive to complement the architecture of its home and celebrate a time in our history when true craftsmanship was embraced, respected, and displayed throughout the home. Whether it's a dramatic entrance, new interior doors, casement or double-hung windows, wall panels or trimwork, each element of your project will receive the highest attention to detail in design, construction, and finish work. Door making is in my heritage. My grandfather was a sash-and-door man for a cabinet shop in San Diego for 40 years, where he built doors and windows for homes, businesses, and hotels. Not only did he leave me his prized tools, all in the handcrafted toolbox he built, he also left me the passion to use them. My career as a door maker began in 2003, when I began my five year apprenticeship with Cliff Jones of CJ's Sash and Door in Fieldbrook, CA. Under his leadership, I built over a thousand windows and doors, mostly for the area's Victorian and Arts-and-Crafts homes. 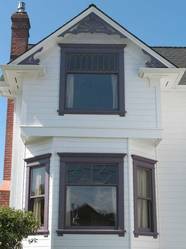 I had spent many of my college years in the woodshop, learning valuable skills on cabinetmaking and general woodworking, but at CJ's, I gained hands-on experience building architectural elements for period homes. In 2008, my wife and I moved to her home town of Martinez, CA in the San Francisco Bay Area, where the Craftsman Door Company was born. Our children are the fifth generation to live on this piece of land, the old vineyards started by my wife's great grandparents. It's here that I have chosen to maintain some of the best traditions of our history, and to lend my talents to keep the heritage of architectural craftsmanship alive.